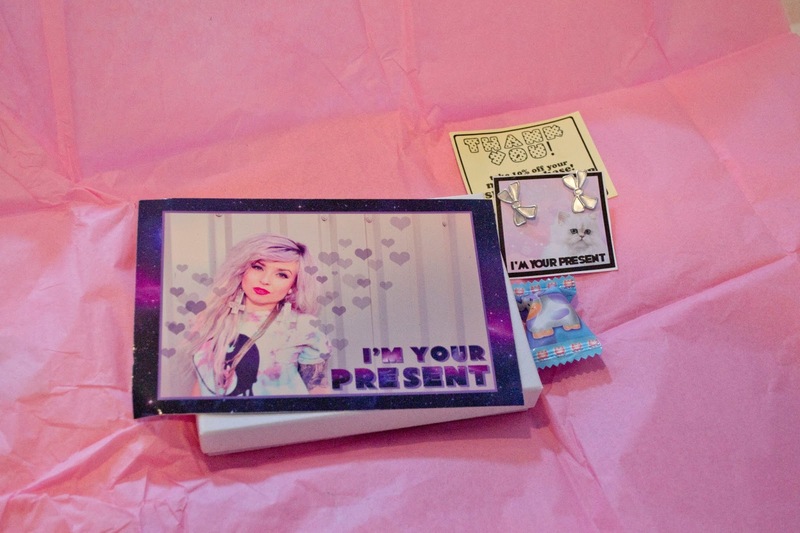 I'm Your Present is the Etsy store owned by RISD graduate Kelly Eident. Although I haven't really personally spoken to her, I can tell that Kelly is such a sweet and amazing person and everything she makes is adorable! It reminds me of a lot of Japanese street fashion style (Spank!) and my favorite thing about her pieces is that they could work well with Japanese fashion inspired outfits but also as a cute accent to an every day look. Her pieces are way cuter than anything you will ever find at a store like Claire's. They are also affordable for something handmade. Even though the clothing can seem expensive, it is actually very well priced considering it is one of a kind and isn't made in a factory. Plus it's always awesome to support small businesses! 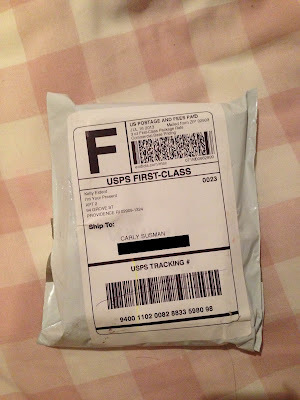 I have ordered from Kelly twice prior to my most recent purchase. The first order I made in 2011 was for the sweetheart earrings she gained a lot of popularity from on Tumblr. 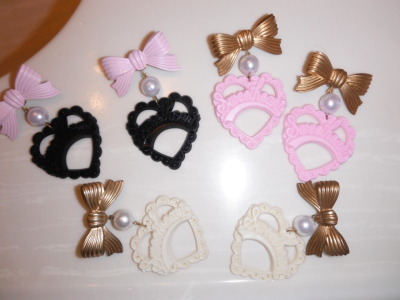 Because I ordered them a while back, they are the first version she was making with gold bows and pearls (see below). I love them and would highly recommend buying them. It's been difficult to resist not getting them in every single color. 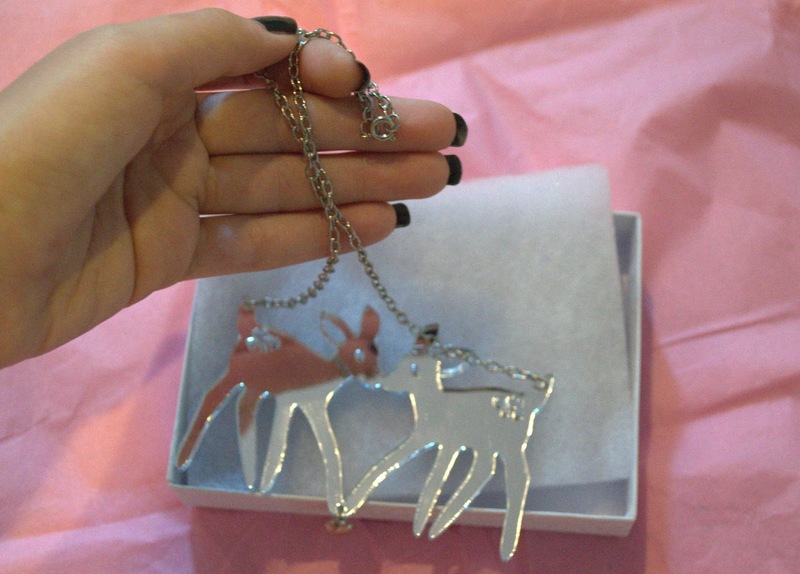 The second purchase of mine was the silver acrylic fawns necklace which was one of my favorite pieces of jewelry ever. On most days, I usually wear just earrings but once I owned this necklace, I wore it all the time. Sadly, these two deer met a tragic fate the day I had a panic attack at work. I was kind of tense and accidentally broke the necklace in half when I held my hands too tight to my chest. It was the worst day and I tried to rescue it with some krazy glue as I sat on the floor of the Barnes and Noble in Union Square but there was nothing I can do. There were a lot of bad things about that day but breaking my favorite necklace was the worst of it. It took me a while to recover from the loss and come around to buying another one but Kelly had a special discount code to use so I felt like the time was right. Unfortunately, Kelly hadn't had a silver deer necklace in her shop for a while and I was set on getting an authentic replacement to my old one. I had messaged her a while back asking if she could make one if I requested it and she said yes. So I ordered it and used my discount code which basically took off however much I would have had to pay for shipping so that was really awesome. I assume that everything, with the exception of the made to order items, are already made if they are listed. But I had to order this one special so I didn't expect it to come in the mail very quickly. 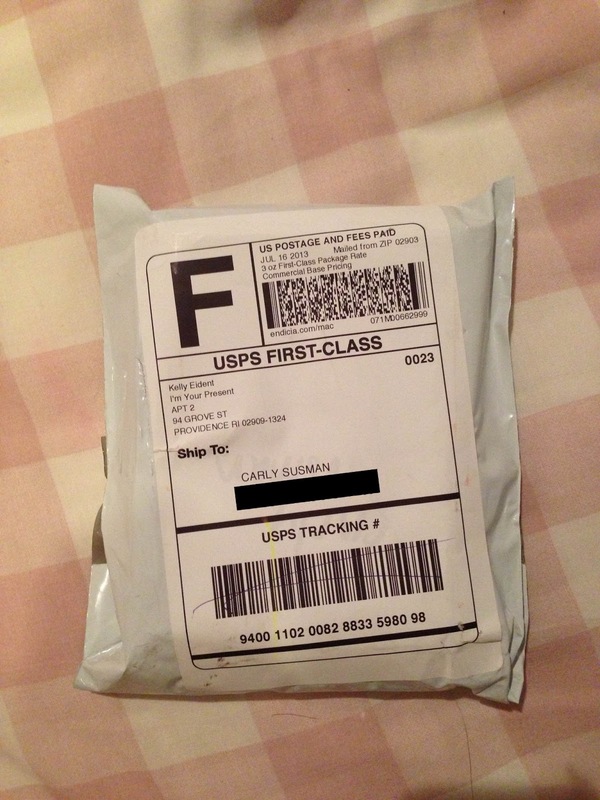 I ordered it on June 28th, it was mailed on July 16th, and it came 3 days later on July 19th. There was also the July 4th holiday thrown in there so that could account for some of the length of time. Buying from Etsy is kind of weird because you just pay for shipping without any idea of how long it will take really. I think there is just a single shipping option. I have only sold a few things on here a while back so I don't remember. Anyway, the time it took wasn't a problem for me because I knew it had to be made and I didn't need it for a specific date. Kelly's packages often come with some other fun surprises. 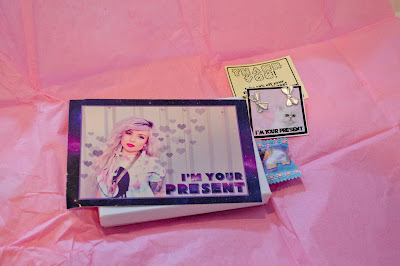 This time I got a post card, candy, silver bow earrings and a card with a discount code for 10% off until August 15th. 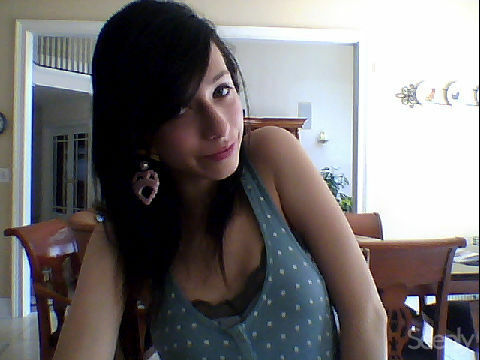 I have been wearing those bow earrings almost every day since they came in the mail. And here is my necklace! There are actually a couple differences between this one and the last one I ordered. The chain is silver and the last time it was gold. I don't really have much of a preference either way but it does look pretty good when it's all one color. The clasp is also different. The last one had this kind that I had never seen before that was sort of like a hinged thing. However mine would never stay totally closed. I tried fixing it with some pliers that made it better. The necklace never actually came off of me so it wasn't a huge deal and it's pretty easy to replace a clasp anyway if I wanted to. Here you can kind of see how this is the more standard type of clasp on the new one. The only issue I have is that it happens to be a little faulty. When you open it, it doesn't spring closed and instead just stays open so you have to manually close it which is a little difficult when you are putting it on yourself. I have a bunch of jewelry findings around my house so I will probably replace it once I get annoyed enough with it. 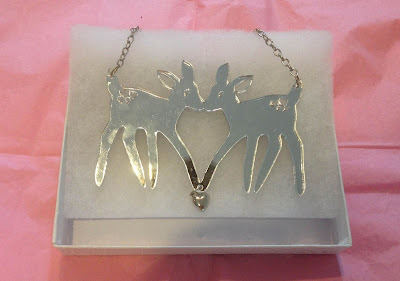 The chain is a little long so that the deer usually overlap the neckline on my shirt because I am a kind of small person and this is a kind of large necklace. So I actually moved the clasp parts a bit in on the chain so that it would sit a little higher on my chest. I didn't cut the chain because I just wanted to try it out and see how it looked before doing anything drastic but I like it a lot more after my adjustments.